"When Daddy was a little boy he loved Ghugni, specially EeeeeeeekkK's Ghugni. When Daddy became a Daddy he still loved Ghugni and really missed EeeeeeeekkK's Ghugni." Hi! I am Sid and this is my favorite bedtime story that my Daddy tells me. I love when he rolls his eyes and makes the funny "EeeeeeeekkK" sound. "EeeeeeeekkK's" was the friendly Ghugni-wala that used to come to Daddy's neighborhood between 4:30 to 5:00 PM everyday, rain or shine, on his hand draw cart to sell the yummiest Ghugni, that you have ever tasted. He used to make this funny sound "EeeeeeeekkK" to let everyone know that he has arrived. Nobody knew his real name and he was popular as the funny "EeeeeeeekkK's" guy. Then Daddy grew big and strong and left the small town to move to a big city and "EeeeeeeekkK'" and his yummy Ghugni became just a delicious memory for Daddy. Mommy however has no such childhood Ghugni memory. Her Mommy was strict and would not let her eat street food. But her numerous Mashis and Pishis, Kakimas and Jethimas (Aunts) fed her a lot of not-so-yummy Ghugnis during Bijoya celebrations and she finally decided that she is not a Ghugni person at all. Things changed when we moved to the US and Mommy saw Daddy and me gobbling up Ghugni at various functions organised by the the Bengali Association here. She asked me if I liked it and I nodded my head vigorously in affirmation. Few days later Mommy made her first ever Ghugni and Daddy rated it as 6 on 10 on his "EeeeeeeekkK-o-meter". Ever since, Mommy's Ghugni skills have improved and she is currently on 9.5! Daddy says he deducts Mommy point because she does not add potatoes and coconut slices (two quintessential ingredients) to her Ghugni, since she wants it to be diabetic friendly. I feel her Ghugni is equally delicious without them. Over to you Mommy for the recipe. Ghugni is a very popular Bengali evening snack. 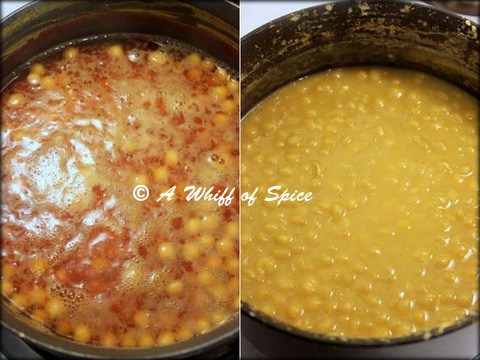 It is made with dried Yellow Peas/ White Vatana Peas. You need to soak it overnight before you proceed to cook them. Here I got 2 cups of White Vatana Peas (this is the name, you get in the Indian Grocery store in US) or Ghugni Motor (as they are called back home). I soaked it overnight and they are all plumped up. In a big sauce pan, combine soaked peas, water, turmeric powder, baking soda and salt. Let it come to a boil and then reduce the heat to medium and cook till the peas are cooked through and tender, about 45 minutes to 1 hour. You can also use a pressure cooker. Just be careful that is not completely mushy. The peas, at least some, should be able to hold their shape. In a separate pan, heat 2 tsp of oil and add cumin seeds and tej patta (bay leaf). Once the cumin stops spluttering add, the finely chopped onions and grated ginger. Fry till the onions are brown and the raw smell of the ginger is gone. The onions should be perfectly caramelized. This is what will impart the deliciousness to the Ghugni. Take it off the flame and add the Bhaja Moshla** and serve hot with the elaborate garnish. ** Bhaja Moshla or Roasted Spice Masala is a combination of spices that are dry roasted on stove top, very low and slow,till you are hit with a heady aroma, then cooled and dry grinded and stored in air tight containers for later use. The one that I used here is a combination of cumin seeds, fennel seeds and dry red chilies. I used ¼ cup of cumin seeds, ¼ cup of fennel seeds, 10-15 dry red chilies (used de-seeded ones if you do not want much heat). I dry roasted the cumin and the fennel seeds on very low flame for 15 mins, till they looked roasted and brown and my kitchen was filled with alluring aroma. The I let it cool for another 15-20 minutes and then I dry grinded it along with the red chilies in my coffee grinder. Stored in air tight container. More than the actual recipe, its how you garnish or rather with what you garnish, makes or break a Ghugni. Tamarind-jaggery Chutney, Green Chutney, finely chopped red onions, sliced green chilies and cilantro and of course Bhaja Moshla are few classic garnishes. Since every individual has different tastes, I usually have the condiments served in separate bowls and let everyone garnish as per their liking. I even got grated coconut for Sam to sprinkle on his bowl of Ghugni. 1. 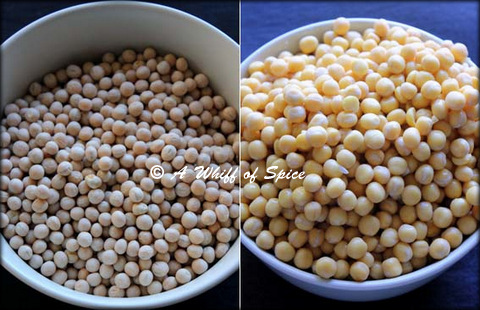 Soak the yellow peas in water overnight or in very hot water for 4-5 hours. 2. Combine soaked peas, water, turmeric powder, baking soda and salt. Let it come to a boil and then reduce the heat to medium and cook till the peas are cooked through and tender, about 45 minutes to 1 hour. You can also use a pressure cooker. Just be careful that is not completely mushy. 3. In a separate pan, heat 2 tsp of oil and add cumin seeds and tej patta (bay leaf). 4. Once the cumin stops spluttering add, the finely chopped onions and grated ginger. 5. Fry till the onions are brown and the raw smell of the ginger is gone. The onions should be perfectly caramelized. This is what will impart the deliciousness to the Ghugni. 7. 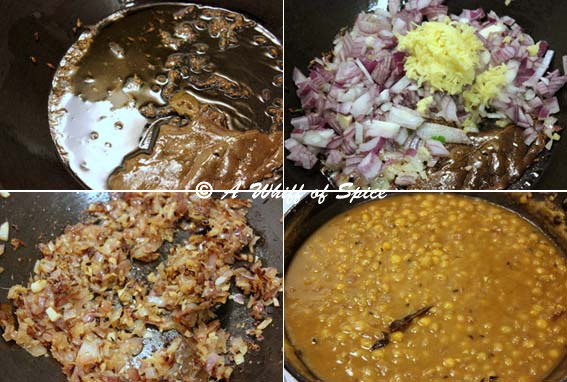 Once the cumin stops spluttering add, the finely chopped onions and grated ginger. 8. Fry till the onions are brown and the raw smell of the ginger is gone. The onions should be perfectly caramelized. This is what will impart the deliciousness to the Ghugni. 9. Add the cooked peas, tamarind paste, coconut (if using), potatoes (if using) and let it simmer for 5-6 minutes. Check for salt and add accordingly. You can also add some sugar at this stage, if you prefer sweet and tangy taste. 10. Take it off the flame and add the Bhaja Moshla** and serve hot with the elaborate garnish. 1. Dry roast the cumin seeds and the fennel seed son a very low flame 15 mins, till they looked roasted and brown. 2. Let it cool for another 15-20 minutes and then dry grind it along with the red chilies in coffee grinder or a dry spice grinder. 3. Stored in air tight container. Ghugni, though a street food is high on nutrition if prepared at home hygienically The White Vatana peas are loaded with nutrients Its high on protein, iron and dietary fibers. If the Ghugni is made without potatoes and coconut, its actually a healthy option for diabetics too. A point to remember is, d not laden your Ghugni with the Tamarind-jaggery chutney. It is loaded with sugar. Squeeze some lime or lemon juice for the tang and fresh flavor. Like most beans and legumes, White or yellow peas are also high on carbohydrates, so limit your snack to a small bowl. You can have a big bowl by itself, or with some fresh salad for lunch too. Enjoyed reading the story! This was a new name for me but reminded me of sev usal that we make. It is very similar and is topped with sev, onion, and other fun things! Here is a link if you would like to see. Thank you for visiting. I read your post and yes its very similar to "Sev Usal". Even in Kolkata, Ghugni is served with a bun in college canteen. Its an awesome street/canteen staple. Italian Wedding Soup for my Wedding Anniversary!